Dude I can’t believe 2017 is almost over. I know I say this every year, but seriously it’s getting weirder and weirder. The older I get the faster time seems to keep flying by. Before we start with the whole “best of” stuff I wanted to say a quick thank you. 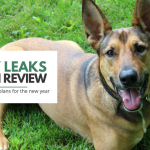 Puppy Leaks had a pretty great year thanks to you. There aren’t enough heart emoticons in the world to show you how much I appreciate every read, share and comment I’ve gotten. Thank you. It’s the end of another year so I thought I’d take this opportunity to do a little year in review. Here’s a look back at some of the biggest posts from this past year, as well as some of my personal favorites. Here’s the most popular posts from Puppy Leaks in 2017. My first attempt to make a dog treat recipe post of my very own. And after writing this I have immense respect anyone who runs a food blog; making one “simple dog treat recipe” into a post is so much harder than it looks. Have you ever tried making a picture of flour and eggs look good in a dimly lit kitchen? Easier said than done. 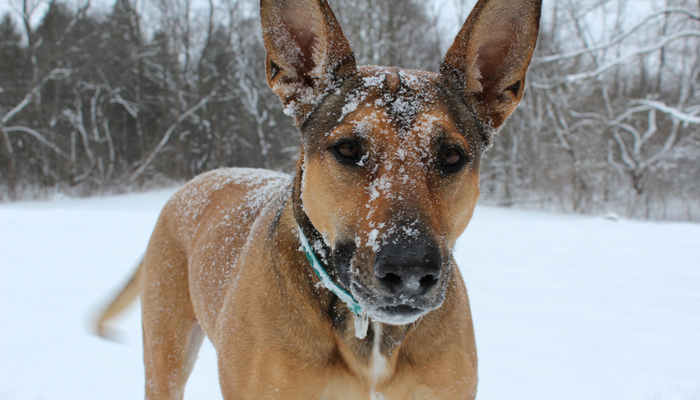 These 3 ingredient dog treats are a favorite of Laika’s. They’re made with basic ingredients (flour, eggs & peanut butter), and they’re easy to make for novice bakers like myself. Finding ways to keep your dog busy and out of trouble is a common theme on this blog, and using mentally stimulating games & activities is one of the best methods I’ve found. 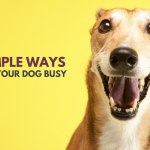 From letting your dog sniff around on walks to having them work for food, there’s plenty of little ways you can give your dog more mental stimulation throughout the day. Looking for a few easy ways to brighten up your dog’s day? Luckily for us our dogs are easy to please, but that doesn’t mean we can’t work to improve their day. 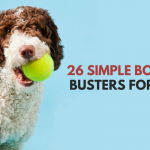 Here’s a list of 25 ways to keep your dog happy. From switching up your walking routine to taking your dog for a trip to visit family & friends, there’s plenty of ways to improve your dog’s day. If you have a young dog I bet you struggle trying to keep up with their energy. A long walk won’t cut it for all dogs. For energetic dogs it’s nice nice to have some physically demanding activities that burn off all that extra energy. 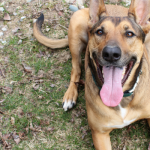 From using a flirt pole to playing a game of tug of war, here’s 5 ways to tire our your dog. Awkward title aside this post was one of my favorites to write. Thinking about yelping every time your puppy bites? Read this first. Laika was an absolute nightmare when it came to teaching bite inhibition, and these are a few of the lessons I learned during that time. I know a random picture of my dog doesn’t technically have anything to do with a “Most Popular Posts” article, but seriously look at that face. 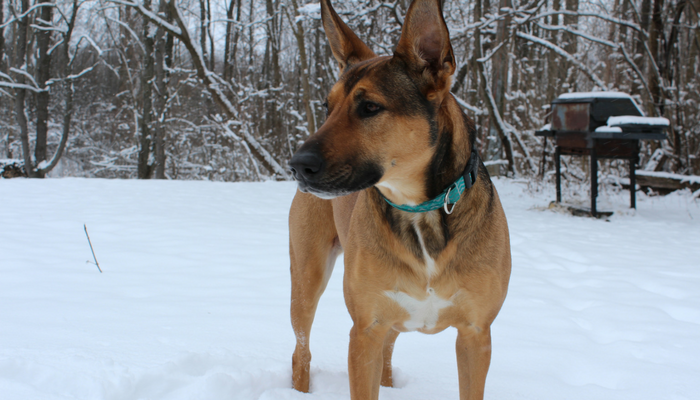 She’s very serious about this recent snow we’ve gotten (and it’s not everyday that I get to show off a picture of Laika looking mature & dignified). It’s hard to know how to comfort someone after they’ve lost a pet, but there are a few things to keep in mind. Here’s 3 examples of what NOT to say after someone loses a pet, and a few examples of what you may want to say instead. Keep in mind these are examples of what not to say to an acquaintance (especially at work or somewhere public), not necessarily a close friend. My previous dog Carter had separation anxiety, and I’d be lying if I said it was easy to manage. It takes a long time (depending on the severity), and it takes a lot of repetition — but it can be managed. Here’s the tips I used to help keep his anxiety under control. These aren’t specific rules as in “how to teach your dog to sit,” but they are a good set of general rules to keep in mind every time you work on training your dog. From being consistent with rules to knowing your dog’s limits, here’s tips that will help make dog training easier. Getting a new dog can be exciting, but it can also be overwhelming. If you’re anything like me you want to do all of the things right away, but sometimes a little patience goes a long way. Here’s 10 ways to help create a strong bond with your new dog. I bookmarked the post on ways to promote mental stimulation. I need to find a printer so I can put it on the bulletin board when I need to give Honey a workout on a rainy day. I like this list – I did something similar on my blog, too.